An Informed Families Ambassador is a person with a passion for making a difference in the lives of our youth. Ambassadors volunteer their time to bring substance abuse prevention to youth and parents in their community by promoting Informed Families' four prevention campaigns. Informed Families provides the tools and support needed for Ambassadors to spread the message! Ambassadors are key to their community to help create a drug-free America! We love to share the news about the great things Ambassadors are doing by featuring activities on our website, Blog and newsletter. The prevention Ambassador program will bring four universal prevention campaigns, education, tips and facts to schools year-round. Deliver the message of drug prevention and positively impact the life of a child in your community. Sign up to become an Ambassador. Implement Informed Families' campaigns in your school. Q: What does an Ambassador do? A: An ambassador coordinates with Informed Families to bring youth substance abuse prevention campaigns to their school. This person will disseminate information, coordinate pledge drives and contests and plan fun prevention related activities to deliver the drug-free message to students and parents. Q: Is there financial compensation? A: No, Ambassadors are not paid by Informed Families. Howerver, we often provide incentives to award and recognize our Ambassadors for their creativity and hard work. Q: How long does the Ambassador training take? A: Ambassador training happens via live webinar in most cases. It is 20 minutes per campaign. Each campaign has it's own webinar. Q: What kind of tools and resources will I get for my school? A: You will get a morning announcement script, a message to send home to parents, pledges for students and/or parents, tools to promote the campaign, plus much more. Q: Is there a cost to participate in this program? A: No. This program is FREE at this time. Get free tools to bring any of these prevention campaigns to your school. Register today! Encourage two friends to become Ambassadors. Bring our four prevention campaigns to your school/community. Sponsor a classroom or school for each of the prevention campaigns. Learn More. 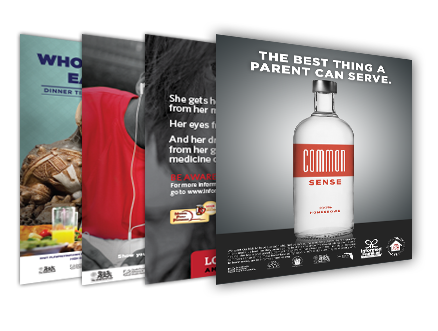 Get professionally printed color posters, pledges and flyers to promote your prevention campaign.